This booklet tells you how to use the R statistical software to carry out some simple multivariate analyses, with a focus on principal components analysis (PCA) and linear discriminant analysis (LDA). This booklet assumes that the reader has some basic knowledge of multivariate analyses, and the principal focus of the booklet is not to explain multivariate analyses, but rather to explain how to carry out these analyses using R.
If you are new to multivariate analysis, and want to learn more about any of the concepts presented here, I would highly recommend the Open University book “Multivariate Analysis” (product code M249/03), available from from the Open University Shop. In the examples in this booklet, I will be using data sets from the UCI Machine Learning Repository, http://archive.ics.uci.edu/ml. There is a pdf version of this booklet available at https://media.readthedocs.org/pdf/little-book-of-r-for-multivariate-analysis/latest/little-book-of-r-for-multivariate-analysis.pdf. If you like this booklet, you may also like to check out my booklet on using R for biomedical statistics, http://a-little-book-of-r-for-biomedical-statistics.readthedocs.org/, and my booklet on using R for time series analysis, http://a-little-book-of-r-for-time-series.readthedocs.org/. The first thing that you will want to do to analyse your multivariate data will be to read it into R, and to plot the data. You can read data into R using the read.table() function. For example, the file http://archive.ics.uci.edu/ml/machine-learning-databases/wine/wine.data contains data on concentrations of 13 different chemicals in wines grown in the same region in Italy that are derived from three different cultivars. There is one row per wine sample. The first column contains the cultivar of a wine sample (labelled 1, 2 or 3), and the following thirteen columns contain the concentrations of the 13 different chemicals in that sample. The columns are separated by commas. In this case the data on 178 samples of wine has been read into the variable ‘wine’. Once you have read a multivariate data set into R, the next step is usually to make a plot of the data. One common way of plotting multivariate data is to make a “matrix scatterplot”, showing each pair of variables plotted against each other. We can use the “scatterplotMatrix()” function from the “car” R package to do this. To use this function, we first need to install the “car” R package (for instructions on how to install an R package, see How to install an R package). You can then use the “scatterplotMatrix()” function to plot the multivariate data. In this matrix scatterplot, the diagonal cells show histograms of each of the variables, in this case the concentrations of the first five chemicals (variables V2, V3, V4, V5, V6). Each of the off-diagonal cells is a scatterplot of two of the five chemicals, for example, the second cell in the first row is a scatterplot of V2 (y-axis) against V3 (x-axis). If you see an interesting scatterplot for two variables in the matrix scatterplot, you may want to plot that scatterplot in more detail, with the data points labelled by their group (their cultivar in this case). 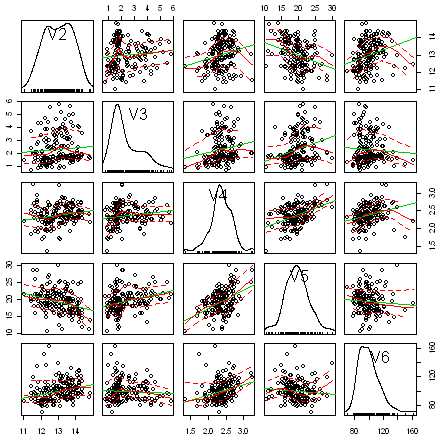 For example, in the matrix scatterplot above, the cell in the third column of the fourth row down is a scatterplot of V5 (x-axis) against V4 (y-axis). 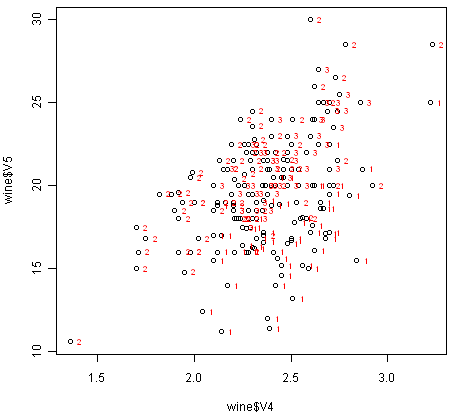 If you look at this scatterplot, it appears that there may be a positive relationship between V5 and V4. 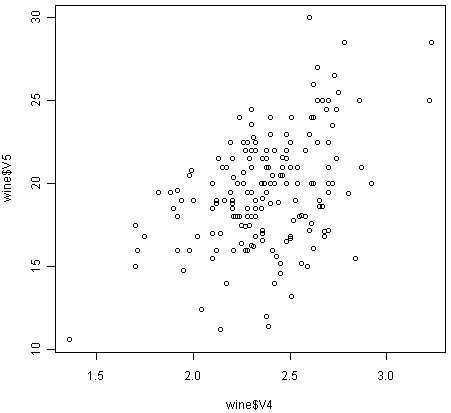 We can see from the scatterplot of V4 versus V5 that the wines from cultivar 2 seem to have lower values of V4 compared to the wines of cultivar 1. Another type of plot that is useful is a “profile plot”, which shows the variation in each of the variables, by plotting the value of each of the variables for each of the samples. The function “makeProfilePlot()” below can be used to make a profile plot. This function requires the “RColorBrewer” library. To use this function, we first need to install the “RColorBrewer” R package (for instructions on how to install an R package, see How to install an R package). To use this function, you first need to copy and paste it into R. The arguments to the function are a vector containing the names of the varibles that you want to plot, and a list variable containing the variables themselves. It is clear from the profile plot that the mean and standard deviation for V6 is quite a lot higher than that for the other variables. Another thing that you are likely to want to do is to calculate summary statistics such as the mean and standard deviation for each of the variables in your multivariate data set. The “sapply()” function can be used to apply some other function to each column in a data frame, eg. sapply(mydataframe,sd) will calculate the standard deviation of each column in a dataframe “mydataframe”. This tells us that the mean of variable V2 is 13.0006180, the mean of V3 is 2.3363483, and so on. We can see here that it would make sense to standardise in order to compare the variables because the variables have very different standard deviations - the standard deviation of V14 is 314.9074743, while the standard deviation of V9 is just 0.1244533. Thus, in order to compare the variables, we need to standardise each variable so that it has a sample variance of 1 and sample mean of 0. We will explain below how to standardise the variables. It is often interesting to calculate the means and standard deviations for just the samples from a particular group, for example, for the wine samples from each cultivar. The cultivar is stored in the column “V1” of the variable “wine”. You can calculate the mean and standard deviation of the 13 chemicals’ concentrations for just cultivar 1 samples, or for just cultivar 3 samples, in a similar way. The function “printMeanAndSdByGroup()” also prints out the number of samples in each group. In this case, we see that there are 59 samples of cultivar 1, 71 of cultivar 2, and 48 of cultivar 3. Thus, the within-groups variance for V2 is 0.2620525. Thus, the between-groups variance of V2 is 35.39742. "variable V2 Vw= 0.262052469153907 Vb= 35.3974249602692 separation= 135.0776242428"
 "variable V3 Vw= 0.887546796746581 Vb= 32.7890184869213 separation= 36.9434249631837"
 "variable V4 Vw= 0.0660721013425184 Vb= 0.879611357248741 separation= 13.312901199991"
 "variable V5 Vw= 8.00681118121156 Vb= 286.41674636309 separation= 35.7716374073093"
 "variable V6 Vw= 180.65777316441 Vb= 2245.50102788939 separation= 12.4295843381499"
 "variable V7 Vw= 0.191270475224227 Vb= 17.9283572942847 separation= 93.7330096203673"
 "variable V8 Vw= 0.274707514337437 Vb= 64.2611950235641 separation= 233.925872681549"
 "variable V9 Vw= 0.0119117022132797 Vb= 0.328470157461624 separation= 27.5754171469659"
 "variable V10 Vw= 0.246172943795542 Vb= 7.45199550777775 separation= 30.2713831702276"
 "variable V11 Vw= 2.28492308133354 Vb= 275.708000822304 separation= 120.664018441003"
 "variable V12 Vw= 0.0244876469432414 Vb= 2.48100991493829 separation= 101.3167953903"
 "variable V13 Vw= 0.160778729560982 Vb= 30.5435083544253 separation= 189.972320578889"
 "variable V14 Vw= 29707.6818705169 Vb= 6176832.32228483 separation= 207.920373902178"
Thus, the individual variable which gives the greatest separations between the groups (the wine cultivars) is V8 (separation 233.9). As we will discuss below, the purpose of linear discriminant analysis (LDA) is to find the linear combination of the individual variables that will give the greatest separation between the groups (cultivars here). This hopefully will give a better separation than the best separation achievable by any individual variable (233.9 for V8 here). If you have a multivariate data set with several variables describing sampling units from different groups, such as the wine samples from different cultivars, it is often of interest to calculate the within-groups covariance and between-groups variance for pairs of the variables. Thus, for V8 and V11, the between-groups covariance is -60.41 and the within-groups covariance is 0.29. Since the within-groups covariance is positive (0.29), it means V8 and V11 are positively related within groups: for individuals from the same group, individuals with a high value of V8 tend to have a high value of V11, and vice versa. 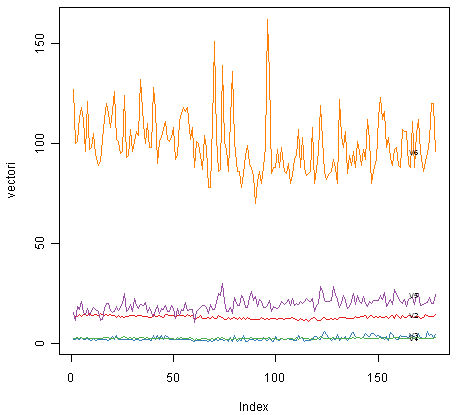 Since the between-groups covariance is negative (-60.41), V8 and V11 are negatively related between groups: groups with a high mean value of V8 tend to have a low mean value of V11, and vice versa. It is often of interest to investigate whether any of the variables in a multivariate data set are significantly correlated. This tells us that the correlation coefficient is about 0.094, which is a very weak correlation. Furthermore, the P-value for the statistical test of whether the correlation coefficient is significantly different from zero is 0.21. This is much greater than 0.05 (which we can use here as a cutoff for statistical significance), so there is very weak evidence that that the correlation is non-zero. If you have a lot of variables, you can use “cor.test()” to calculate the correlation coefficient for each pair of variables, but you might be just interested in finding out what are the most highly correlated pairs of variables. For this you can use the function “mosthighlycorrelated()” below. The function “mosthighlycorrelated()” will print out the linear correlation coefficients for each pair of variables in your data set, in order of the correlation coefficient. This lets you see very easily which pair of variables are most highly correlated. To use this function, you will first have to copy and paste it into R. The arguments of the function are the variables that you want to calculate the correlations for, and the number of top correlation coefficients to print out (for example, you can tell it to print out the largest ten correlation coefficients, or the largest 20). This tells us that the pair of variables with the highest linear correlation coefficient are V7 and V8 (correlation = 0.86 approximately). If you want to compare different variables that have different units, are very different variances, it is a good idea to first standardise the variables. For example, we found above that the concentrations of the 13 chemicals in the wine samples show a wide range of standard deviations, from 0.1244533 for V9 (variance 0.01548862) to 314.9074743 for V14 (variance 99166.72). This is a range of approximately 6,402,554-fold in the variances. As a result, it is not a good idea to use the unstandardised chemical concentrations as the input for a principal component analysis (PCA, see below) of the wine samples, as if you did that, the first principal component would be dominated by the variables which show the largest variances, such as V14. Thus, it would be a better idea to first standardise the variables so that they all have variance 1 and mean 0, and to then carry out the principal component analysis on the standardised data. This would allow us to find the principal components that provide the best low-dimensional representation of the variation in the original data, without being overly biased by those variables that show the most variance in the original data. You can standardise variables in R using the “scale()” function. Note that we use the “as.data.frame()” function to convert the output of “scale()” into a “data frame”, which is the same type of R variable that the “wine” variable. We see that the means of the standardised variables are all very tiny numbers and so are essentially equal to 0, and the standard deviations of the standardised variables are all equal to 1. To carry out a principal component analysis (PCA) on a multivariate data set, the first step is often to standardise the variables under study using the “scale()” function (see above). This is necessary if the input variables have very different variances, which is true in this case as the concentrations of the 13 chemicals have very different variances (see above). Once you have standardised your variables, you can carry out a principal component analysis using the “prcomp()” function in R.
In this case, we see that the total variance is 13, which is equal to the number of standardised variables (13 variables). This is because for standardised data, the variance of each standardised variable is 1. The total variance is equal to the sum of the variances of the individual variables, and since the variance of each standardised variable is 1, the total variance should be equal to the number of variables (13 here). 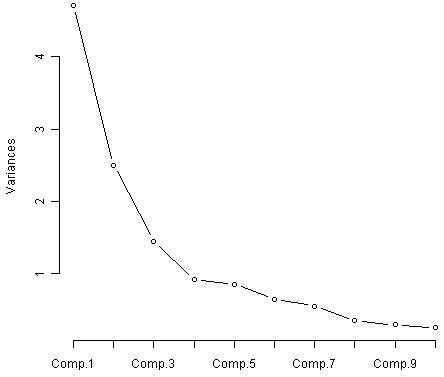 The most obvious change in slope in the scree plot occurs at component 4, which is the “elbow” of the scree plot. Therefore, it cound be argued based on the basis of the scree plot that the first three components should be retained. This means that the first principal component is a linear combination of the variables: -0.144*Z2 + 0.245*Z3 + 0.002*Z4 + 0.239*Z5 - 0.142*Z6 - 0.395*Z7 - 0.423*Z8 + 0.299*Z9 -0.313*Z10 + 0.089*Z11 - 0.297*Z12 - 0.376*Z13 - 0.287*Z14, where Z2, Z3, Z4...Z14 are the standardised versions of the variables V2, V3, V4...V14 (that each have mean of 0 and variance of 1). This means that the second principal component is a linear combination of the variables: 0.484*Z2 + 0.225*Z3 + 0.316*Z4 - 0.011*Z5 + 0.300*Z6 + 0.065*Z7 - 0.003*Z8 + 0.029*Z9 + 0.039*Z10 + 0.530*Z11 - 0.279*Z12 - 0.164*Z13 + 0.365*Z14, where Z1, Z2, Z3...Z14 are the standardised versions of variables V2, V3, ... V14 that each have mean 0 and variance 1. Above, we intepreted the second principal component as a contrast between the concentrations of V11, V2, V14, V4, V6 and V3, and the concentration of V12. In the light of the mean values of these variables in the different cultivars, does it make sense that the second principal component can separate cultivar 2 from cultivars 1 and 3? In cultivar 1, the mean values of V11 (0.203), V2 (0.917), V14 (1.171), V4 (0.325), V6 (0.462) and V3 (-0.292) are not very different from the mean value of V12 (0.458). In cultivar 3, the mean values of V11 (1.009), V2 (0.189), V14 (-0.372), V4 (0.257), V6 (-0.030) and V3 (0.893) are also not very different from the mean value of V12 (-1.202). In contrast, in cultivar 2, the mean values of V11 (-0.850), V2 (-0.889), V14 (-0.722), V4 (-0.444), V6 (-0.364) and V3 (-0.361) are much less than the mean value of V12 (0.432). Therefore, it makes sense that principal component is a contrast between the concentrations of V11, V2, V14, V4, V6 and V3, and the concentration of V12; and that principal component 2 can separate cultivar 2 from cultivars 1 and 3. The purpose of principal component analysis is to find the best low-dimensional representation of the variation in a multivariate data set. For example, in the wine data set, we have 13 chemical concentrations describing wine samples from three cultivars. By carrying out a principal component analysis, we found that most of the variation in the chemical concentrations between the samples can be captured using the first two principal components, where each of the principal components is a particular linear combination of the 13 chemical concentrations. 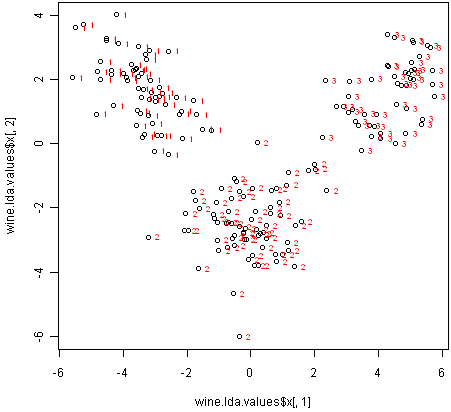 The purpose of linear discriminant analysis (LDA) is to find the linear combinations of the original variables (the 13 chemical concentrations here) that gives the best possible separation between the groups (wine cultivars here) in our data set. Linear discriminant analysis is also known as “canonical discriminant analysis”, or simply “discriminant analysis”. If we want to separate the wines by cultivar, the wines come from three different cultivars, so the number of groups (G) is 3, and the number of variables is 13 (13 chemicals’ concentrations; p = 13). The maximum number of useful discriminant functions that can separate the wines by cultivar is the minimum of G-1 and p, and so in this case it is the minimum of 2 and 13, which is 2. Thus, we can find at most 2 useful discriminant functions to separate the wines by cultivar, using the 13 chemical concentration variables. You can carry out a linear discriminant analysis using the “lda()” function from the R “MASS” package. To use this function, we first need to install the “MASS” R package (for instructions on how to install an R package, see How to install an R package). This means that the first discriminant function is a linear combination of the variables: -0.403*V2 + 0.165*V3 - 0.369*V4 + 0.155*V5 - 0.002*V6 + 0.618*V7 - 1.661*V8 - 1.496*V9 + 0.134*V10 + 0.355*V11 - 0.818*V12 - 1.158*V13 - 0.003*V14, where V2, V3, ... V14 are the concentrations of the 14 chemicals found in the wine samples. For convenience, the value for each discriminant function (eg. the first discriminant function) are scaled so that their mean value is zero (see below). Note that these loadings are calculated so that the within-group variance of each discriminant function for each group (cultivar) is equal to 1, as will be demonstrated below. The function calclda() simply calculates the value of a discriminant function for each sample in the data set, for example, for the first disriminant function, for each sample we calculate the value using the equation -0.403*V2 - 0.165*V3 - 0.369*V4 + 0.155*V5 - 0.002*V6 + 0.618*V7 - 1.661*V8 - 1.496*V9 + 0.134*V10 + 0.355*V11 - 0.818*V12 - 1.158*V13 - 0.003*V14. Furthermore, the “scale()” command is used within the calclda() function in order to standardise the value of a discriminant function (eg. the first discriminant function) so that its mean value (over all the wine samples) is 0. It doesn’t matter whether the input variables for linear discriminant analysis are standardised or not, unlike for principal components analysis in which it is often necessary to standardise the input variables. However, using standardised variables in linear discriminant analysis makes it easier to interpret the loadings in a linear discriminant function. It makes sense to interpret the loadings calculated using the group-standardised variables rather than the loadings for the original (unstandardised) variables. In the first discriminant function calculated for the group-standardised variables, the largest loadings (in absolute) value are given to V8 (-0.871), V11 (0.537), V13 (-0.464), V14 (-0.464), and V5 (0.438). The loadings for V8, V13 and V14 are negative, while those for V11 and V5 are positive. Therefore, the discriminant function seems to represent a contrast between the concentrations of V8, V13 and V14, and the concentrations of V11 and V5. We saw above that the individual variables which gave the greatest separations between the groups were V8 (separation 233.93), V14 (207.92), V13 (189.97), V2 (135.08) and V11 (120.66). These were mostly the same variables that had the largest loadings in the linear discriminant function (loading for V8: -0.871, for V14: -0.464, for V13: -0.464, for V11: 0.537). We found above that variables V8 and V11 have a negative between-groups covariance (-60.41) and a positive within-groups covariance (0.29). When the between-groups covariance and within-groups covariance for two variables have opposite signs, it indicates that a better separation between groups can be obtained by using a linear combination of those two variables than by using either variable on its own. Thus, given that the two variables V8 and V11 have between-groups and within-groups covariances of opposite signs, and that these are two of the variables that gave the greatest separations between groups when used individually, it is not surprising that these are the two variables that have the largest loadings in the first discriminant function. We can see that although the loadings are different for the first discriminant functions calculated using unstandardised and group-standardised data, the actual values of the first discriminant function are the same. To calculate the separation achieved by each discriminant function, we first need to calculate the value of each discriminant function, by substituting the variables’ values into the linear combination for the discriminant function (eg. -0.403*V2 - 0.165*V3 - 0.369*V4 + 0.155*V5 - 0.002*V6 + 0.618*V7 - 1.661*V8 - 1.496*V9 + 0.134*V10 + 0.355*V11 - 0.818*V12 - 1.158*V13 - 0.003*V14 for the first discriminant function), and then scaling the values of the discriminant function so that their mean is zero. The returned variable has a named element “x” which is a matrix containing the linear discriminant functions: the first column of x contains the first discriminant function, the second column of x contains the second discriminant function, and so on (if there are more discriminant functions). "variable LD1 Vw= 1 Vb= 794.652200566216 separation= 794.652200566216"
 "variable LD2 Vw= 1 Vb= 361.241041493455 separation= 361.241041493455"
As mentioned above, the loadings for each discriminant function are calculated in such a way that the within-group variance (Vw) for each group (wine cultivar here) is equal to 1, as we see in the output from calcSeparations() above. The output from calcSeparations() tells us that the separation achieved by the first (best) discriminant function is 794.7, and the separation achieved by the second (second best) discriminant function is 361.2. Therefore, the total separation is the sum of these, which is (794.652200566216+361.241041493455=1155.893) 1155.89, rounded to two decimal places. Therefore, the “percentage separation” achieved by the first discriminant function is (794.652200566216*100/1155.893=) 68.75%, and the percentage separation achieved by the second discriminant function is (361.241041493455*100/1155.893=) 31.25%. Therefore, the first discriminant function does achieve a good separation between the three groups (three cultivars), but the second discriminant function does improve the separation of the groups by quite a large amount, so is it worth using the second discriminant function as well. Therefore, to achieve a good separation of the groups (cultivars), it is necessary to use both of the first two discriminant functions. We found above that the largest separation achieved for any of the individual variables (individual chemical concentrations) was 233.9 for V8, which is quite a lot less than 794.7, the separation achieved by the first discriminant function. Therefore, the effect of using more than one variable to calculate the discriminant function is that we can find a discriminant function that achieves a far greater separation between groups than achieved by any one variable alone. 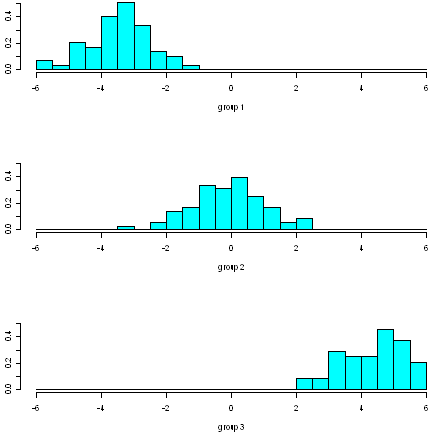 A nice way of displaying the results of a linear discriminant analysis (LDA) is to make a stacked histogram of the values of the discriminant function for the samples from different groups (different wine cultivars in our example). We can see from the histogram that cultivars 1 and 3 are well separated by the first discriminant function, since the values for the first cultivar are between -6 and -1, while the values for cultivar 3 are between 2 and 6, and so there is no overlap in values. However, the separation achieved by the linear discriminant function on the training set may be an overestimate. 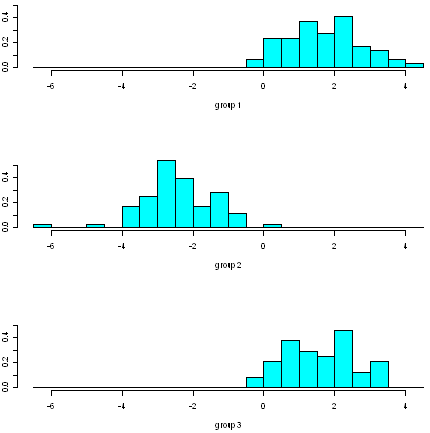 To get a more accurate idea of how well the first discriminant function separates the groups, we would need to see a stacked histogram of the values for the three cultivars using some unseen “test set”, that is, using a set of data that was not used to calculate the linear discriminant function. We see that the first discriminant function separates cultivars 1 and 3 very well, but does not separate cultivars 1 and 2, or cultivars 2 and 3, so well. We see that the second discriminant function separates cultivars 1 and 2 quite well, although there is a little overlap in their values. Furthermore, the second discriminant function also separates cultivars 2 and 3 quite well, although again there is a little overlap in their values so it is not perfect. Thus, we see that two discriminant functions are necessary to separate the cultivars, as was discussed above (see the discussion of percentage separation above). 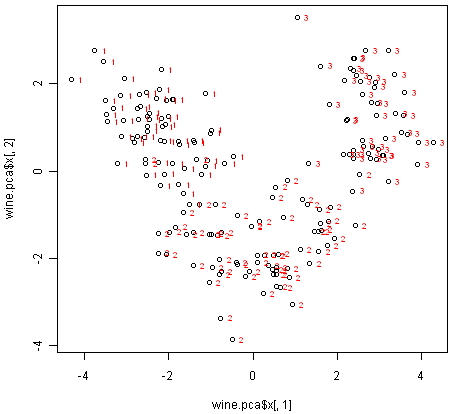 From the scatterplot of the first two discriminant functions, we can see that the wines from the three cultivars are well separated in the scatterplot. The first discriminant function (x-axis) separates cultivars 1 and 3 very well, but doesn’t not perfectly separate cultivars 1 and 3, or cultivars 2 and 3. The second discriminant function (y-axis) achieves a fairly good separation of cultivars 1 and 3, and cultivars 2 and 3, although it is not totally perfect. To achieve a very good separation of the three cultivars, it would be best to use both the first and second discriminant functions together, since the first discriminant function can separate cultivars 1 and 3 very well, and the second discriminant function can separate cultivars 1 and 2, and cultivars 2 and 3, reasonably well. We find that the mean value of the first discriminant function is -3.42248851 for cultivar 1, -0.07972623 for cultivar 2, and 4.32473717 for cultivar 3. The mid-way point between the mean values for cultivars 1 and 2 is (-3.42248851-0.07972623)/2=-1.751107, and the mid-way point between the mean values for cultivars 2 and 3 is (-0.07972623+4.32473717)/2 = 2.122505. "Number of samples of group 1 classified as group 1  :  56 (cutoffs: -1.751107 , NA )"
 "Number of samples of group 1 classified as group 2  :  3 (cutoffs: -1.751107 , 2.122505 )"
 "Number of samples of group 1 classified as group 3  :  NA (cutoffs: 2.122505 , NA )"
 "Number of samples of group 2 classified as group 1  :  5 (cutoffs: -1.751107 , NA )"
 "Number of samples of group 2 classified as group 2  :  65 (cutoffs: -1.751107 , 2.122505 )"
 "Number of samples of group 2 classified as group 3  :  1 (cutoffs: 2.122505 , NA )"
 "Number of samples of group 3 classified as group 1  :  NA (cutoffs: -1.751107 , NA )"
 "Number of samples of group 3 classified as group 2  :  NA (cutoffs: -1.751107 , 2.122505 )"
 "Number of samples of group 3 classified as group 3  :  48 (cutoffs: 2.122505 , NA )"
There are 3+5+1=9 wine samples that are misclassified, out of (56+3+5+65+1+48=) 178 wine samples: 3 samples from cultivar 1 are predicted to be from cultivar 2, 5 samples from cultivar 2 are predicted to be from cultivar 1, and 1 sample from cultivar 2 is predicted to be from cultivar 3. Therefore, the misclassification rate is 9/178, or 5.1%. The misclassification rate is quite low, and therefore the accuracy of the allocation rule appears to be relatively high. However, this is probably an underestimate of the misclassification rate, as the allocation rule was based on this data (this is the “training set”). If we calculated the misclassification rate for a separate “test set” consisting of data other than that used to make the allocation rule, we would probably get a higher estimate of the misclassification rate. To learn about multivariate analysis, I would highly recommend the book “Multivariate analysis” (product code M249/03) by the Open University, available from the Open University Shop. There is a book available in the “Use R!” series on using R for multivariate analyses, An Introduction to Applied Multivariate Analysis with R by Everitt and Hothorn. Many of the examples in this booklet are inspired by examples in the excellent Open University book, “Multivariate Analysis” (product code M249/03), available from the Open University Shop. I am grateful to the UCI Machine Learning Repository, http://archive.ics.uci.edu/ml, for making data sets available which I have used in the examples in this booklet. Thank you to the following users for very helpful comments: to Rich O’Hara and Patrick Hausmann for pointing out that sd(<data.frame>) and mean(<data.frame>) is deprecated; to Arnau Serra-Cayuela for pointing out a typo in the LDA section; to John Christie for suggesting a more compact form for my printMeanAndSdByGroup() function, and to Rama Ramakrishnan for suggesting a more compact form for my mosthighlycorrelated() function.